You'd be forgiven for thinking, if you watched today's Sony Gamescom conference, that Sony has already given up on the PlayStation Vita. Sony's 80-minute presser was all PS4, without much mention of their underappreciated handheld. 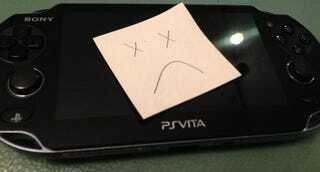 In fact, the Vita even lost an exclusive—Tearaway—giving gamers one less reason to buy an expensive new portable system. It's too bad, really. I love my Vita—in fact, Danganronpa and Danganronpa 2 might be my favorite games of 2014 so far—and I wish it had more support. There are threads on GAF and Reddit wondering why the Vita was a no-show. One particularly nasty Reddit thread is full of anger and frustration from Vita fans who feel like they've been abandoned. This comes just two months after the embarrassing Final Fantasy Type-0 gaffe in which Sony higher-ups declared that Square's RPG was coming to Vita, calling it a "megaton," only to take back the announcement just a few minutes later. People were not pleased. Really, if Sony isn't going to support the Vita with big new games, they could at least bolster the library of PS1 classics. And maybe add some PS2 games up in there. Please?